When it comes to unearthing the influences behind Chainmail (1971), Gary Gygax and Jeff Perren's medieval rules with a fantasy twist, you need to cast a wide net. Many authors (myself included) have been guilty of singling out Tony Bath as the primary influence behind the mass combat rules in Chainmail, but that has always been something of an oversimplification. There are elements of Perren's medieval rules which drew directly from a 1957 archery system proposed by Charles Sweet, one that recurs in the Lake Geneva Tactical Studies Association (LGTSA) rules up to the publication of Chainmail. 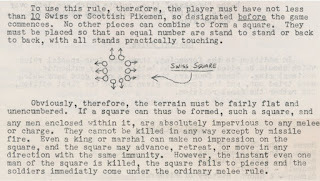 A clear connection can be observed in the values in this chart from Sweet's rules, originally published in War Game Digest Vol. 1 No. 4. This 1957 system determines how many kills archers will score when firing on targets: when a "volley group" of 5 archers fires on some unarmored footmen, they will kill either 2 of their targets (on roll of 1-3) or 3 (on a roll of 4-6). The same 5 archers firing on men-at-arms automatically kill 2, no die roll needed. Hitting fully-armored knights requires larger groups of archers and higher rolls. Our 5 archers would only kill one such target on a roll of 5-6, otherwise they miss. As Sweet writes, "this rule reflects realism in that to kill a fully armored knight some real sharp-shooting had to be done to find a chink in the armor." Finally, he proposes still higher difficulties for firing on hero figures like kings and marshals. Sweet's system has four categories of armor instead of Bath's two, and is slightly more lethal. 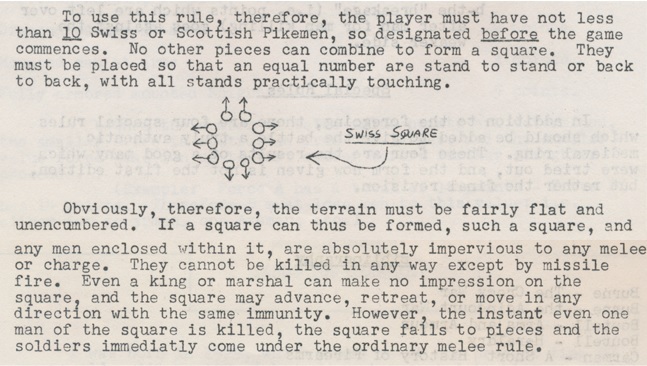 Perren famously collected four pages of medieval wargame rules that were used by Gygax and others in the LGTSA for their games with Elastolin and Airfix figures. He included Sweet's missile rules, but since Perren's four-page system lacked anything like the rules for kings and marshals devised by Sweet, his chart has only three classes of targets: unarmored, half-armored, and fully-armored ones. Gygax published his first adaptation of these rules in Panzerfaust in April of 1970, and shortly thereafter, published a very slight expansion in the pages of the Domesday Book. 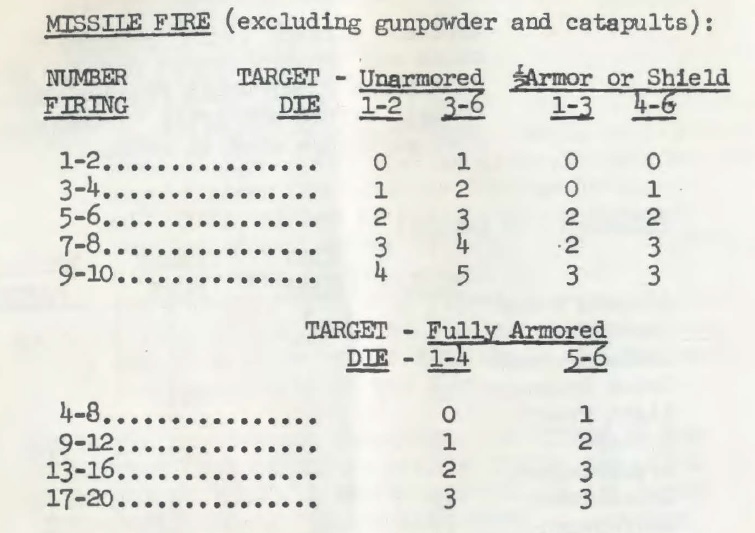 Those two versions include Perren's chart almost verbatim: in Panzerfaust, Gygax explicitly specifies the sorts of missiles that this table covers, including axes and spears in addition to just bowshot. These rules then made their way into Chainmail in 1971, where they apply to all missile fire apart from gunpowder and catapults. Fourteen years after Charlie Sweet first published them, the values for the number firing and the number of targets killed for the dice ranges remain basically constant. In the open and collaborative community of wargaming, these sorts of appropriations were the rule, not the exception. Don Featherstone anthologized rules from early zines like the War Game Digest in his books throughout the 1960s with little by way of credit to original authors. What is perhaps most striking about Perren's use of Sweet's rules is that they were largely confined to this missile mechanism - largely. As both Perren and Gygax have Swiss ancestry, they lavished attention on the legendary Swiss pikemen of medieval times, and we should probably perceive a chain of connection from Sweet to Perren to the LGTSA rules to Chainmail on that subject as well. The tables are not exactly identical. In Sweet's rules group of 17-20 archers, firing at fully amored knights kills 4 of them on a roll of 4-6. Perren's "original" rules replicate that value; Gygax changed it in Domesday Book though - the same group of archers will kill only 3 fully amored targets, regardless of a die roll. Moreover, Perren's rules clarify: "Hits for medium range. Deduct 1 at long range and add 1 at close". Does it appear in Sweet's rules? Gygax dropped it in Chainmail for some reason. *squints* Oh right you are. Who can say if it's a copying error, or a design decision. I don't see that text about deductions/additions for ranges in Sweet. And by "Perren's rules" I've meant five purple-font pages from Panzerfaust zine. I use this table in my OD&D campaign, while judging mass combats. Why Did Armor Class Descend from 9 to 2?